Reviewer pages just got a redesign! If you’re like most journal editors you likely spend upwards of 60% of your time managing peer reviewers. Every time you sit down to work on your journal there are reviewer invitations to send, invitation statuses to check, and review deadlines to track. It’s a lot to keep up with and we know the neater the work space the better! In order to improve editors’ experience managing peer reviewers on Scholastica, we’ve just overhauled the Reviewers Table and individual reviewer pages designs and added some helpful functionality. The updated reviewer pages feature a cleaner design and improved reviewer sorting, plus, best of all, the reviewer pages are now mobile friendly! Get the details below. There are many factors that influence reviewers’ willingness to work with your journal after they’ve completed an initial assignment from you, but one of the simplest is the rate at which you invite them back to review. It’s important to stay in touch with the scholars in your reviewer pool and send them review requests on a regular basis to keep them engaged with your journal - just not too regularly! To help you avoid over or under inviting reviewers, we’ve added a new “Last Invited” column to the Scholastica Reviewers Table. How should you use the “Last Invited” column? We recommend sitting down with all of your journal editors to decide how long you will wait between re-inviting a reviewer to work with your journal, whether they accepted or declined your last invitation. From there, you can check the “Last Invited” column on the Reviewers Table to quickly see which reviewers were last invited within your chosen buffer period. With more journals publishing than ever, there’s a lot of pressure being put on researchers to peer review. Your journal wants to be sure to keep reviewers engaged but not overwhelm them and risk driving them away. Are you one of the many journal editors constantly checking up on your reviewers to make sure invites have been sent to them (and hopefully accepted!) and that their reviews are being submitted on time? We thought so! That’s why we think you’ll be excited about the fact that the new reviewer pages are now mobile friendly! 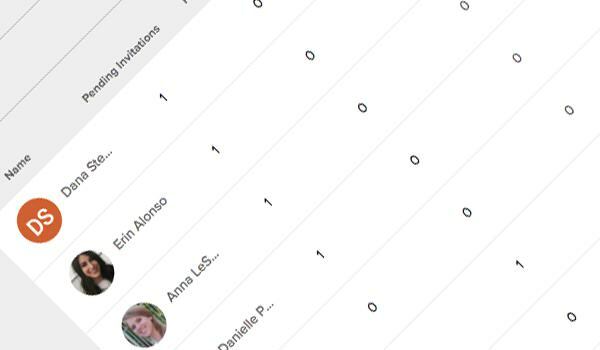 That means you can quickly view individual reviewer profiles right from your phone or tablet to check when a reviewer was last invited, reviewer stats like average days to completion, notes left by your editorial team, and more. The redesigned Reviewer Table and individual reviewer pages have also been updated to give editors a better user experience overall. The new Reviewer Table features a cleaner and more compact design that makes it easier to scan all reviewers in the Reviewers Table results pages. Additionally, we’ve added first and last name initial avatars to all reviewers who have not uploaded a photo of themselves to Scholastica, so you can quickly spot reviewers by their initials. The new individual reviewer pages also have an improved design, with reviewer tags and notes made more easily accessible at the top of the page. You can access both from the left-hand side on each reviewer page. Additionally, you can quickly scan the section of specialties reviewers have assigned to themselves to determine if they’re the right fit for a manuscript. We hope you enjoy the new and improved Reviewers Table and reviewer pages. As always, if you have any questions please don’t hesitate to email us at support@sholasticahq.com.